I came across this recipe in People magazine last winter and knew it was one I needed to try once my fresh herbs were thriving. Now, I am not usually one for large chunks of tomato (in anything) so this recipe was a bit outside the box for me. In fact, my mom was shocked that I was even going to attempt it. I believe her exact words were "Do you even like tomatoes?". After I thought about it (and answered, "No. '), I decided to be adventurous and try to be a grown up and eat tomato chunks. However, I first decided to chop those tomatoes as small as I could and crush them beyond recognition while cooking. The result was pleasant for everyone. The sauce was a delightful sauce that was thick, but not chunky and a nice break from store bought pasta sauce. This is time consuming, but well worth the effort. I can't wait to make this for mom someday! In a skillet, heat olive oil over medium-high heat. Add tomatoes, salt, red pepper, black pepper, and garlic. Cook for a few minutes until tomatoes begin to soften. Next, use a potato masher to chop tomatoes finely. Cook for 20-25 minutes until sauce has thickened, stirring frequently and continuing to mash to desired consistency. Meanwhile, bring a pot of water to a boil. Add noodles and cook just shy of al dente, about 7 minutes. Drain. 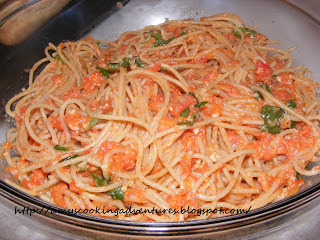 Add pasta to sauce and cook over medium high heat tossing until pasta is tender. Remove from heat. Stir in cheese and basil. Serve with soft bread sticks and enjoy! Nothing like a delicious plate of spaghetti and tomato sauce to put you in the right mindset!